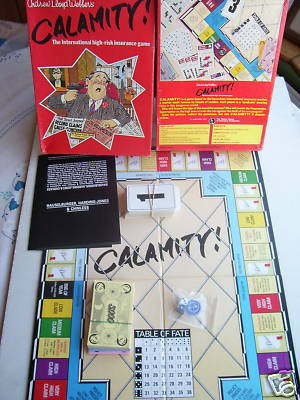 CALAMITY! is a game based on the hazardous international insurance market; a market made famous by Lloyds of London. Each player is a ' syndicate' insuring risks in this dangerous world. Who will insure the legs of the beautiful acteress? Who will insure the Panamanian Supermarket on the high seas or even the Zoo against the theft of its rare Penquin? Issue the polices, collect the premiums, but risk CALAMITY! if disaster strikes!! !